Christian Formation (Sunday School) at Good Samaritan is inclusive. The entire church gathers after brunch for the class lesson. Since several of our members have intellectual disabilities, we use material from Friendship Ministries (designed to include those with intellectual disabilities) for the morning’s activity. Songs, activities and storytelling are part of the lessons. Good Samaritan Church also includes time for Fellowship. Brunch is offered each Sunday after worship. Dinner & Game night is another opportunity to gather together. Preparing Manna bags for the homeless brings the church family together to help others. 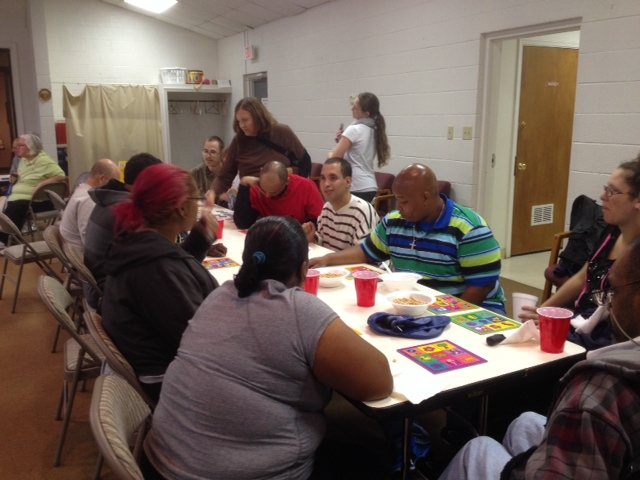 Several families gather for Bunco once a month in the parish hall.